Nick Senzel does not have any MLB stats for the season. Draft: 2016, Cincinnati Reds, 1st rd. Last name is pronounced sen-ZELL...was selected by the Reds in the first round (2nd overall) of the June 2016 first-year player draft...was rated the best pure hitter in that draft...was the Reds' highest draft pick since they took SS Kurt Stillwell with the second pick of the 1983 draft...for the second consecutive season (2018, 2019) is rated by Baseball America and MLB.com's MLB Pipeline the best overall prospect in the organization...entered 2019 rated 10th on Baseball America's Top 100 Prospects list..following the 2018 season was rated by Baseball America the best player in the organization, the International League's best defensive second baseman and the IL's sixth-best prospect overall...was the organization's Minor League Player of the Month for June 2018...in 2017 received the Sheldon "Chief" Bender Award as the Reds' Minor League Player of the Year, was a Baseball America All-Star, the organization's Player of the Month for August, Southern League Player of the Week for 8/7-8/13 and participated in both the Florida State League All-Star Game and SiriusXM All-Star Futures Game...in 2016 was an MiLB.com Organization All-Star...in November 2017 participated in a leadership training program at West Point..in 2019 participated in his second Major League spring training camp as a non-roster invitee. Played at the University of Tennessee, where he majored in psychology...was a semifinalist for the 2016 Golden Spikes Award, an award given annually to the best amateur baseball player in the country...in 2015 was named the Cape Cod League's Most Valuable Player, the league's best professional prospect and Summer Collegiate Baseball Player of the Year...follow on Twitter @LilSenzii. On 6/28 had season-ending surgery to reduce a fracture in his right index finger...there was no damage to the tendon in that finger...on 10/16 had arthroscopic surgery to clean out bone spurs in his left elbow...prior to that elbow surgery played LF and CF during the Reds' instructional league games...suffered the finger injury on 6/22 while playing for Class AAA Louisville...when injured ranked fifth in the International League in hitting and finished his season with an active 11-game hitting streak (22-50, .440)...from 5/8-5/28 also was disabled with symptoms of vertigo...for the Bats played 2B (28g), 3B (14g) and SS (1g)...on 4/30 vs Columbus hit an inside-the-park home run..was the organization's Player of the Month for June (19g, .387, 8 2b, 3hr, 16rbi, 3sb, .434obp, .613slg, 1.047ops)...following the season was rated by Baseball America the best player in the organization, the International League's best defensive second baseman and the IL's sixth-best prospect overall...entered the season rated by Baseball America and MLB.com the best prospect in the organization...was a non-roster invitee to 2018 Major League spring training camp, his first. 2017: In 119 apps at Class A Daytona and Class AA Pensacola combined to hit .321 with 40 doubles, 3 triples, 14 HR, 65 RBI and 14 stolen bases...received the Sheldon "Chief" Bender Award as the organization's Minor League Player of the Year, was a Baseball America All-Star, Southern League Player of the Week for 8/7-8/13 (5g, .522, 4hr, 9rbi, 1.690ops) and participated in both the Florida State League All-Star Game and SiriusXM All-Star Futures Game...was the organization's Player of the Month for August (22g, .359, 4 2b, 6hr, 16rbi, 4sb, 1.092ops)...following the season was rated by Baseball America the second-best prospect in the Southern League and fourth-best prospect in the Florida State League...also was rated the FSL's best batting prospect and best defensive third baseman...among all Reds minor leaguers was rated best hitter for average and infielder with the best arm...among all Reds minor leaguers ranked second in hitting (.321) and fourth in RBI (65)...2016: Following the season was rated by Baseball America the top prospect in the Midwest League and by MiLB.com the top prospect in the organization and 43rd-best prospect overall...was an MiLB.com Organization All-Star...made his professional debut on 6/17 for Billings vs Missoula and went 2-for-3 with a run scored, 2 RBI and a stolen base...was hit by a pitch in his first plate appearance...at Class A Dayton, his .567 slugging percentage and ratio of extra-base hits per game (.57) were the highest marks in franchise history for a player with at least 50 apps. April 23, 2019 Louisville Bats activated LF Nick Senzel from the 7-day injured list. April 3, 2019 Louisville Bats placed LF Nick Senzel on the 7-day injured list. 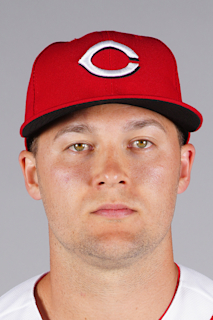 January 9, 2019 Cincinnati Reds invited non-roster 3B Nick Senzel to spring training. September 28, 2018 Louisville Bats activated LF Nick Senzel from the 7-day injured list. June 23, 2018 Louisville Bats placed 2B Nick Senzel on the 7-day disabled list. April 4, 2018 2B Nick Senzel assigned to Louisville Bats from Pensacola Blue Wahoos. January 22, 2018 Cincinnati Reds invited non-roster 3B Nick Senzel to spring training. September 28, 2017 Pensacola Blue Wahoos activated 3B Nick Senzel from the 7-day disabled list. September 3, 2017 Pensacola Blue Wahoos placed 3B Nick Senzel on the 7-day disabled list. June 22, 2017 3B Nick Senzel assigned to Pensacola Blue Wahoos from Daytona Tortugas. April 3, 2017 3B Nick Senzel assigned to Daytona Tortugas from Louisville Bats. March 29, 2017 3B Nick Senzel assigned to Louisville Bats from Dayton Dragons. March 24, 2017 3B Nick Senzel assigned to Cincinnati Reds. July 1, 2016 3B Nick Senzel assigned to Dayton Dragons from Billings Mustangs. June 16, 2016 3B Nick Senzel assigned to Billings Mustangs. June 14, 2016 Cincinnati Reds signed 3B Nick Senzel.